Most of us have a boss of some kind. And a lot of people think that bosses only want to hear good news all of the time, but that's not the case. Positive information is nice, but negatives are just as important. If issues are preventing you, your coworkers, or your company from doing a job well, it makes life harder on everyone — including your boss. As long as you are bringing solutions with the problems, your boss will thank you for pointing out areas that need improvement. So, speak up on the following things, and do yourself and the boss a favor. Most of us don't want to coast through our careers without learning, growing, and climbing the ladder. To do that, we need to face new challenges, step outside of our comfort zones, and take on tasks that will sometimes throw us into the deep end. While it's a scary prospect at times, it's essential for genuine advancement. The boss needs to know this ASAP, because small problems can become big problems, and those big problems can lead to lawsuits and dismissals. You only have to look at the issues plaguing Hollywood right now to know that keeping things hidden could hurt you in the long term. So, whether it's unwanted attention, inappropriate comments, discrimination, or bullying, tell your boss as soon as you notice the problem. Furthermore, document the issues when they happen, as this gives your boss solid evidence that can help with human resources and dealing with an employee that is making your life difficult. In many companies, bosses aren't privy to the day-to-day events and processes that their employees are going through. If your boss is in and out of meetings all day, traveling weekly, and working on large projects, it will be hard for them to know what the morale situation is like. Maybe it's great. Maybe it's awful and people are ready to quit. Either way, if you can give the boss a regular temperature reading on morale, you will be doing everyone a favor. And even if morale is great, there's nothing wrong with asking for team building events to keep it there. Your relationship with your boss is in some ways like a relationship with a romantic partner. Little things here and there can get on your nerves, and you bottle up your feelings. These small frustrations can eat away at you day after day, and become overwhelming. So, find the time to bring them up in a weekly status report or one-on-one. Don't whine. Don't complain. And don't do it without having possible solutions up your sleeve. The boss will be thankful that you addressed it sooner rather than later. One of the biggest reasons people leave a job is their relationship with the boss, and in some instances this could have been repaired long before it became an issue. So, find ways to tell the boss what they're doing right, and what they could be doing better. Suggest things the other employees are asking for. Maybe they would like more transparency, and weekly updates on the status of the company. Perhaps they want a simple night out every month, together as a team, to help with morale. Let the boss know. Of course, judge each case by its merits, and never insult. If your boss is known to be sensitive, you should throw a lot of great compliments out before hitting them with a problem. Start with what makes you happy and excited to come to work every day (and if you can't think of anything, you should probably start looking for a new job immediately). Are there certain projects that really get you going? Are there challenges you enjoy taking on? 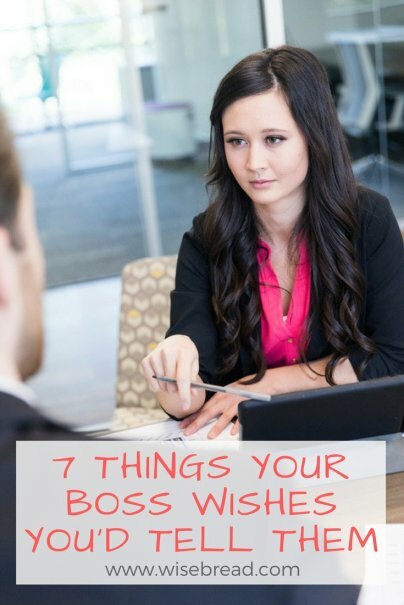 Make a list of all the reasons you enjoy coming to work, and let your boss know about them. He or she will not only appreciate it, but may throw more of those things at you when the opportunity arises. Nothing stirs a boss quite like an employee who is driven to do better, be better, and go further. Self-improvement is an admirable quality, and if you see ways in which you could grow and become a greater asset to the company, talk to your boss about it. Is there a conference coming up that would be invaluable to you? Ask if you can attend. Are there skills you would like to learn? Research workshops and online training. Remember, at the end of the day, if you make your boss look good, you will prosper. So talk to him or her about any of these topics in a cordial way, and work together to resolve any problems. You will do your career a world of good.